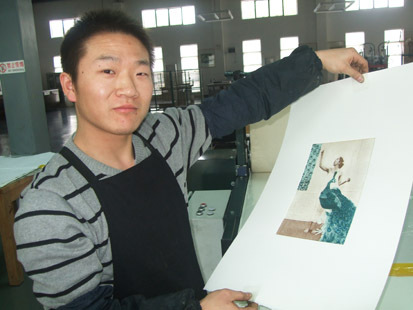 I spent 2 weeks at the Guanlan Print Base and Artist's Village, near Shenzhen, South China in January 2009. I was given accommodation in converted Hakka housing and my own studio in the workshop. Half of the original Hakka village has been converted into modern living accommodation for guest artists. The rest is used as gallery spaces: some awarded rent free to well known Chinese artists, others let to commercial print galleries. 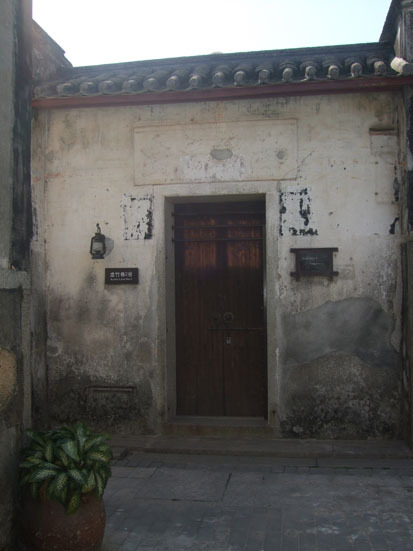 The Hakka buildings were made from earth roughly 200 years ago. Resembling weathered stone cottages, they blend harmoniously with a newly created landscape of ponds and fields tended by workers using ancient farming methods. A modern suite of offices and a huge hanger size workshop rise incongruously from this rural setting. The base can accommodate up to a hundred artists at any one time. When I was there, for two weeks in January this year, there were only eleven other artists who overlapped with me – two Spanish artists and nine Chinese, it being a relatively quiet period leading up to the Spring Festival or Chinese New Year. Artists can stay for as long as they like: I decided that two weeks would be sufficient! All were there as guests; there is no arrangement whereby artists can pay to use the facility. The other artists I met included Zhongi Xi, an important painter, printmaker, senior professor of Shenzhen University and editor of the journal Chinese Printmaking, famous woodcutters Chen Yuping, Wu Enqi and his wife Shan Dan, and Yan Min, a screenprinter. Only a handful of westerners have been guest artists at the base to date so I was a bit of a novelty. I was shown a lot of China’s renowned hospitality. Zhongi Xi and his family gave me a tour of Shenzhen University including his impressive personal studio on campus – the size reflecting his university status. I spent an afternoon in Shenzhen - a modern city which has sprung up in the last 20 years. In the workshop my etching plates and screenprints were editioned meticulously by the resident technicians. 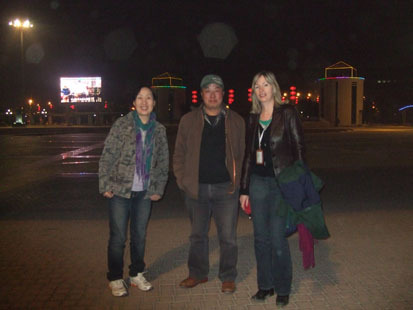 Language difficulties were usually overcome by the helpful translator, Kiki, pictured below with Chen Cong.